For its 19th season Driftwood Theatre Company has taken a break from Shakespeare to tackle one of the great epics of Western literature. It is presenting a stage version of Homer’s Odyssey, created by Winnipeg writer Rick Chafe for that city’s Shakespeare in the Ruins in 2000. To translate such a massive epic to the stage might seem to be an impossible task, but Chafe has managed it with verve and imagination. Director D. Jeremy Smith presents Chafe’s adaptation with a consistently inventive theatricality that draws the audience into both the adventures of Odysseus and the tribulations of Odysseus’ wife Penelope, beset with 107 suitors for her hand. Homer does not tell Odysseus’ tale in chronological and neither does Chafe. Instead, he omits or collapses scenes to heighten the drama in an episodic tale. 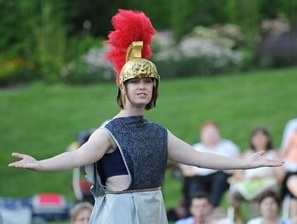 Chafe begins the play with an introduction sung by the goddess Athena (Lori Nancy Kalamanski), the main Olympian deity who protects Odysseus throughout his journey. He begins with Book 5 when Odysseus (Christopher Darroch) takes his leave of the nymph Calypso (Sedina Fiati), with whom he spent seven years in captivity. He then shifts the scene to Ithaca where Penelope (Sarah Machin Gale) and her maid Eurycleia (Kalamanski) are attempting to cope with the increasingly inpatient suitors. Telemachus (Chris George), son of Odysseus and Penelope, has gone away for fear the suitors will kill him since, if Odysseus is dead, he would be the rightful king of Ithaca. Soon a Stranger (Tim Machin) appears who claims to have news of both Telemachus and Odysseus. He is reviled by the suitors, especially the most dangerous of them, Eurymachus (Andy Pogson), but Penelope wants to hear what he knows. He then proceeds to tell her that Odysseus is alive and portrays his happy reception by the Phaeacians. At a banquet in his honour Odysseus tells the tale of what happened to him and his men immediately after the Trojan War (Book 9). Eventually, the narrative voice passes from Odysseus back to the Stranger. Chafe’s first clever idea is to have Penelope and the Stranger look on and even participate in Odysseus’ adventures, just as listeners and storytellers are drawn into a story. His second clever idea is to interleave the Stranger’s and Odysseus’ stories of his adventures with Penelope’s growing despair over how to control the suitors and prevent them from killing Telemachus should he return. While Homer uses Penelope’s plight as the frame for the narrative of Odysseus’ adventures, Chafe’s is more dramatic. It more directly relates the trials of both husband and wife, always keeps Penelope’s predicament forward in our minds and creates tension in Odysseus’ tales as he comes ever closer to Ithaca and to resolving Penelope’s worsening situation. As director and scenic designer, Smith stages the play in the round on a small square platform with entrances on all four sides. The base of a column several feet from one corner serves as a second platform to highlight individual speakers. What makes the show so exciting is Smith’s high level of theatrical invention. Two simple lengths of blue cloth agitated at either end represent waves or wrapped about a performer, ends fluttering, represent the wind. One length of cloth becomes the Phaeacians’ banquet table, the sharpened pole to put out the single eye of the giant Polyphemus or the bag of winds given Odysseus by Aeolus. The overwhelming atmosphere of myth and magic in the play is not accomplished by special effects but by emphasizing the theatrical space as a place of transformation. Achieving maximum effects through minimal means seems to be the hallmark of this production. The giant Polyphemus is represented by one huge eye mounted on a long pole. The shades of the dead in Hades are the cast covered in long grey cloth draped over head-shaped objects on poles. Numerous effects are achieved simply through the cast’s abilities at synchronized mime – whether it be rowing, capsizing, falling under the spell of the lotus flowers or being shot through with arrows. The world premiere production of Chafe’s adaptation used nine performers. Smith needs only eight, which means that many play three or more roles. Actors change roles simply by donning masks or by slipping from one of Melanie McNeill’s imaginative costumes, designed for quick changes, to another. Christopher Darroch is excellent in his main role as Odysseus. His strong voice and clear diction are qualities many actors of his age at major festivals have not yet mastered. He fully captures Odysseus as a natural leader whose reckless lust for triumph is both his strength and weakness. Tim Machin gives a multilayered performance as the Stranger, who always keeps an eye on Penelope to note her reaction to his stories and catch any sign of recognition. As Penelope, Sarah Machin Gale, focusses on the woman’s anger and distress, but one might wish her to show a greater ambiguity towards the Stranger who seems to know so much about her husband. Chris George ably conveys Telemachus’ youth and over-eagerness. Andy Pogson sharply distinguishes the roles as the obnoxious suitor Eurymachus from the rather elfin deity Hermes, as does Lori Nancy Kalamanski her roles as Athena, Eurycleia and Polyphemus. Janick Hebert gives us a seductive Circe of dangerously volatile moods and Sedina Fiati effectively conveys the sincerity of Calypso’s love for Odysseus. Chafe’s language is straightforward and achieves a rugged poetry by employing almost exclusively the common words of Anglo-Saxon origin in the English vocabulary. Repeated words like “sea”, “wind”, “ship”, “god” and “man” link the episodes together as a series of blows Odysseus received from fate. Chafe’s restricted vocabulary brings out the themes of Homer’s work that any endeavour entails loss as well as gain and that the best way humans can embarrass the gods is by enduring unbowed whatever woes they send them. Smith and his amazingly unified ensemble portray The Odyssey both as a fantastic adventure tale and as an intensely personal drama among Odysseus, Penelope and Telemachus. After seeing their performance, you will impressed once again with how Homer’s ancient epic continues to thrill and how Chafe and Driftwood Theatre have so vividly passed that thrill on to us. Photo: (top) Sarah Machin Gale as Penelope and Christopher Durroch as Odysseus; (middle) Lori Nancy Kalamanski as Athena. ©2013 Driftwood Theatre.